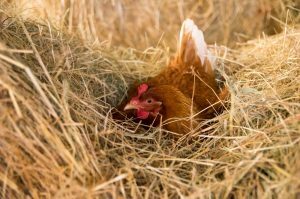 A soft clucking from high up in the hay bales reveals a hen nestled on a clutch of eggs. Farmer Bruce Craven mentions in a patiently exasperated tone that some in the flock know that they can fly, and this is one of those hens who flies over the fence, and waits for him to open the door so she can get to her favorite spots in the barn. Backwater Farm, run by Bruce and wife Desiree, delivers fresh eggs to the Astoria Co-op once a week. Their 40-acre farm on Puget Island is named for the peaceful backwaters of the Columbia River that border their pastures in the form of the East and West Sturgeon Sloughs. A diverse flock of hens are fanned out across the red stems of mowed buckwheat: Black Australorp, Speckled Sussex, Welsumer, Novogen Brown layers, Americauna and other breeds. The buckwheat cover crop was planted to improve soil tilth after the heavy traffic of pasturing their heritage Lowline Angus beef cattle over the winter. In midsummer, when the buckwheat bloomed, it became a source of nectar for their honeybees, and now the chickens scratch for fallen grain and insects. 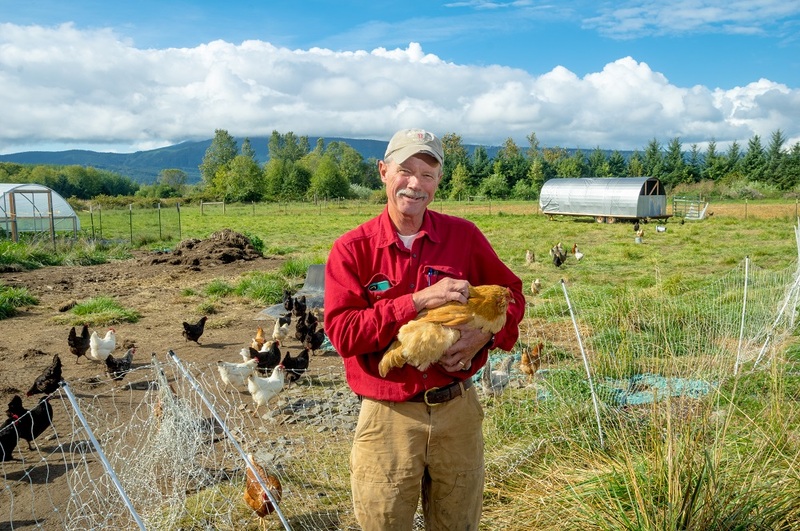 A henhouse that Bruce custom built on the frame of an old Winnebago trailer can be pulled with a tractor to rotate the chickens through the fields. These integrated natural and sustainability-focused farming practices are central to how Backwater Farm is managed. The eggs from these free-range chickens are flavorful and have rich orange-yellow colored yolks due to their varied diet. In contrast to chickens raised in confinement, these chickens also lay fewer eggs since they expend more energy when they run about and forage. 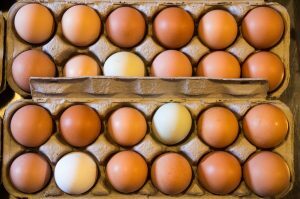 In Bruce’s packing room, the eggs fill the cartons in orderly rows with colors ranging from creamy brown to chocolate, and the occasional teal or white egg. They’re packed as ungraded eggs, which means that they aren’t sorted by size so each dozen contains a mixture of small to extra-large eggs. In general the small eggs are laid by younger chickens, and a hen lays larger eggs as she gets older. While delivering to the Astoria Co-op one week, Bruce was walking in with cartons of eggs when a family approached him and said, “You’re the egg guy?! Can I shake your hand?” They shared that the kids really enjoyed the eggs from Backwater Farm. Bruce compliments the Astoria Co-op on how great they have been to work with. The Co-op has been understanding of the realities of sourcing from small scale local farms, and they’ve been willing to accept the natural, seasonal fluctuations in egg production, or unexpected demands of the farm that might delay a delivery. The constant need for problem-solving and creativity is an engaging aspect of farming for Bruce. “More often than not, I don’t decide what I’m going to do; the farm tells me what I’m going to do for the day.” There are frustrations, like the fence he spent several hours on only to have a hen fly over it two minutes after he’d finished. On the other hand they also find themselves part of a community on Puget Island where neighbors will come over to help out when needed. He finds he enjoys the daily variety and physical activities. Bruce’s first connection with Puget Island was as a place to go fishing when he worked and lived in Portland. While technically retired now, Bruce is too busy to go fishing as he and Desiree build and manage the farm so that the chickens, beef cattle and honeybees contribute to the mortgage. Yet, he says they find their days are pretty rich and full. A gentle billow of smoke, sweet with the rich aroma of salmon, escapes the smokehouse door as we peek inside. A century ago, in 1917, Mike Josephson’s grandfather, Anton Josephson, tried his hand at smoking fish fresh from the docks. 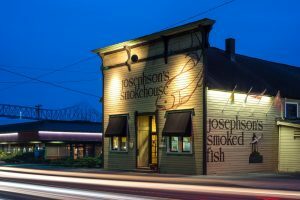 Starting in 1920, Josephson’s Smokehouse opened at the same storefront you can find it in today, just past downtown Astoria heading westbound on Marine Drive. In the cold case at the Astoria Cooperative Grocery you can also find Josephson’s smoked salmon and salmon jerky, custom packed for the Co-op. Cold-smoked is the traditional Scandinavian style originally used by the Josephson family. The salmon is cured in salt, then rinsed, and smoked. 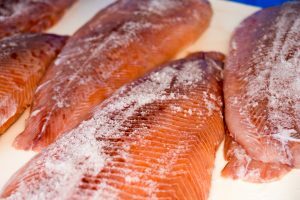 The relatively cool temperatures used (90 degrees Fahrenheit or less) means that the fish is preserved but maintains a delicate silky texture that can be sliced, whereas hot-smoked fish is cooked to a firm texture that can be flaked into pieces. Smoked salmon retains the bright color of the wild fish due to the smoking process itself. The flavor also becomes richer, more complex. Nowadays, Josephson’s primarily uses a modern smoker that’s run by a computer using specialized software to control and monitor the process, along with precisely controlled smoke generators stoked with a blend of Alder wood chips. Mike says the current preference people have is for what they produce in the modern smoker. The traditional method creates a heavier smoked skin; it’s drier, and somewhat reminiscent of a ham. Since there are some people who really love it, Josephson’s smokes about 3 batches a year of the traditional style. If you stop by Josephson’s Smokehouse you’ll most likely meet Ashley Moore at the front counter. Astoria born and raised, she’s worked at Josephson’s for 10 years now, starting when she was just 17. Ashley says she’s never caught a fish before, with the caveat that she did proudly reel in some seaweed at the age of 7. She knows the Smokehouse well and can offer knowledgeable answers and delicious samples. Mike’s father, Cecil Josephson, was a fisherman. In the main room there’s still the loft where the nets were stored, and in that room Mike says he vividly remembers his dad melting and attaching the metal lead line to the nets. The current entryway walls are decorated with old photographs, and what is now the storefront was the living room for Mike’s grandparents. 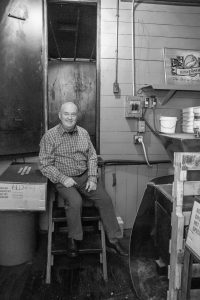 Mike started helping out at the Smokehouse at age 12, using a wire brush to clean the rust and fish scales off of what were then steel hooks used in the smoke room. Pointing to a heavy wheel-shaped contraption leaned up against the wall Mike explains that it was the hoist they used in the cannery that they cranked by hand, lifting tens of thousands of pounds of Columbia River Chinook from the boats. Josephson’s produced just one product for 60 years, until after Mike took over the business from his parents in 1978. They’ve since diversified to create 7 flavors of salmon jerky, 23 types of canned fish, 18 types of hot smoked fish and shellfish, and 3 types of cold smoked salmon lox. They operate an extensive mail-order business, shipping worldwide from their historic storefront on the bank of the Columbia River. 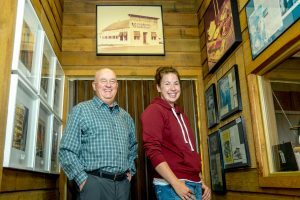 Farmer Tom Zimmerman has been selling to the Co-op since the 1970’s when the Co-op was new and Tom was new to farming. As a 13 year old boy in 1976, Zimmerman moved with his family from Gearhart to the farm they own today in Gray’s River, Washington. When he was finishing up his studies at Clatsop Community College, Zimmerman decided he wanted a career in his family trade. 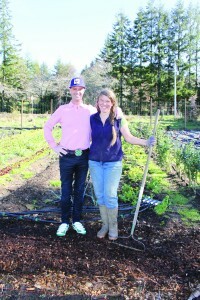 Farmer Tom Zimmerman and the Co-op’s Kelly Huckestein. “I’ve always liked growing plants,” Zimmerman said. Zimmerman’s roots in farming sets him apart from some of the other small farmers we work with in the area. Another key difference is that the farm is certified organic. Many small farmers use organic practices, but find it difficult to make certification pencil out. Zimmerman says organic certification hasn’t been too hard; it does cost him, but the USDA chips in, typically paying about half of the fees, thanks to a farm bill. 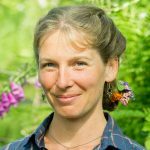 Even for someone as experienced as Zimmerman, farming is always a challenge, for a variety of reasons including working with dynamic natural elements. That’s why a key to Zimmerman’s success is diversity of crops, which he calls a common sense approach to crop insurance. “The most challenging part of the job; the weather, especially lots of rain, but it’s been pretty nice this year,” Zimmerman said. Another challenge for smaller farmers is finding a place to sell their products. 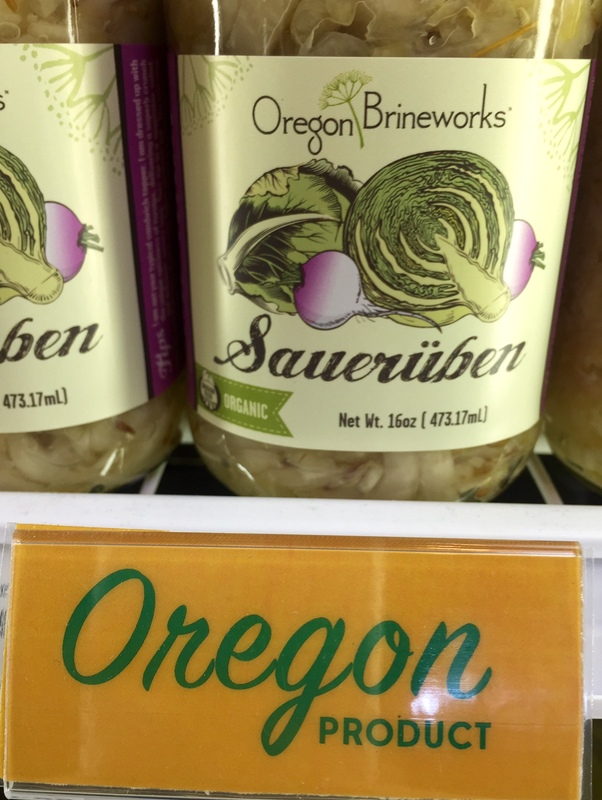 Zimmerman says there’s more competition with organic farms, and less of a market than some places in the country, but value added food processing such as Oregon Brineworks (in Hood River, OR) which he sells direct to helps. Zimmerman says dry weather in California could impact and actually improve the market for local farmers. “The farmers in California aren’t shipping cheap produce anymore,” Zimmerman said. He does all his own distributing and knows all his customers. “Growing good food for people that’s what the most rewarding part is, I’d probably be happiest if I didn’t have to deal with the money, but that’s not how we live our lives,” Zimmerman said. Zimmerman grows all kinds of row crops, such as fabulous kale and other greens, celery, peppers, and strawberries. Look for Glory B (Zimmerman’s) veggies, berries, and honey at the Co-op. The freshest local food of the season will highlight an upcoming spring farm to fork dinner. Astoria Co-op Grocery, Columbia Memorial Hospital’s Nutritional Department, and Chef Marco Davis are joining forces again in an effort to inspire people to eat fresh and healthy foods. The menu will include four courses with lots of vegetables and fish. Davis creates the menu just before the dinner in order to capture the freshest most local food around. “I like having relationships with people I’m getting food from. I know they’re putting the same love into farming as I do cooking. It tastes so much better and it makes me happy,” Davis said. In addition to a meal there are elements of entertainment and education involved. Many of the local farmers will attend the dinner and take turns speaking about how they grew the food. The setting is in a gourmet demonstration kitchen so attendees will be able to watch and learn as their dinner is prepared before their eyes. 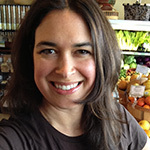 “Educating people about health and nutrition is important to the Co-op and a really fun way to learn is while eating amazing food and drinking wine with friends,” Astoria Co-op Grocery Marketing Director Zetty Nemlowill said. CMH became involved in the Farm to Fork event because food is really the foundation of health in the community. “As a Planetree designated hospital, we recognize nutrition and the nurturing aspect of food as a component of the care that we provide both to our patients and to our caregivers. The Farm to Fork dinners provide education about healthy cooking and eating, but also about where to find fresh, healthy food in our community. And, really, it’s super fun,” CMH Nutrition Services Manager Vann Lovett said. The event is volunteer-run and any proceeds beyond the cost of ingredients go to North Coast Food Web’s Project Fruit Box which provides organic fruit to local schools. Tickets are $40 each and include a four course dinner and wine. Space is limited so organizers encourage you to get your tickets as soon as possible. Tickets are available via Eventbrite. When: Thursday June 2 at 6 p.m. If you’ve ever had food directly out of a garden, you know the flavor beats any conventional grocery produce, correct? The food we source from nearby farmers is just as good, if not better than food from your own garden. 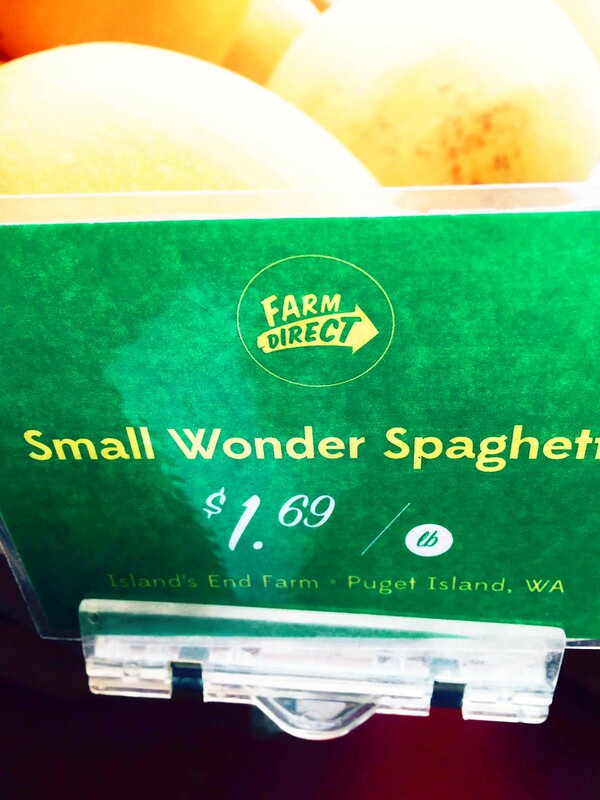 Big grocery stores have noticed that people really like local food. You can’t help but miss the large photographs of “local” farmers in produce departments. I’ve seen “local” peaches from Yakima. 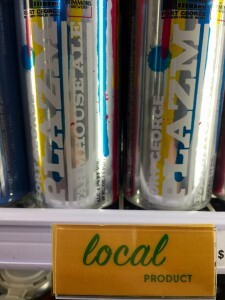 This is really different from Astoria Co-op Grocery’s idea of what local food is. So, our competition presents an interesting challenge for the Co-op; defining “local”. Fresh food from farms in the area that are too small to supply bigger grocery stores gives the Co-op a competitive edge. So it’s very important for us to all understand the “local” difference at the Co-op. I wish I could think of something catchy like the Nike “just do it” catch phrase that would, in an instant, meaningfully convey the “truly” local difference at the Co-op to anyone who walks in our doors. But I haven’t yet. So, for now, the Co-op will define our version of “local” with honesty; using all our communication tools to consistently tell you where your food comes from. Look for signs in the store that say “local” and “farm direct”. These are items we source from farmers and other producers from within a 40 mile radius. Growers and manufacturers we build relationships with actually deliver the products themselves. We like to get products from as close to home as possible, but many food, beverage, and wellness items are not currently available within our defined local area. 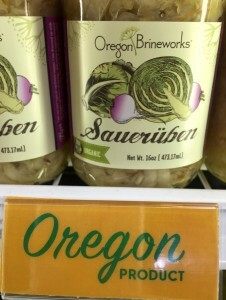 So you will see “Oregon” and “Washington” signs throughout the store as well. While not exactly “local”, we’re very proud of carrying these unique items. 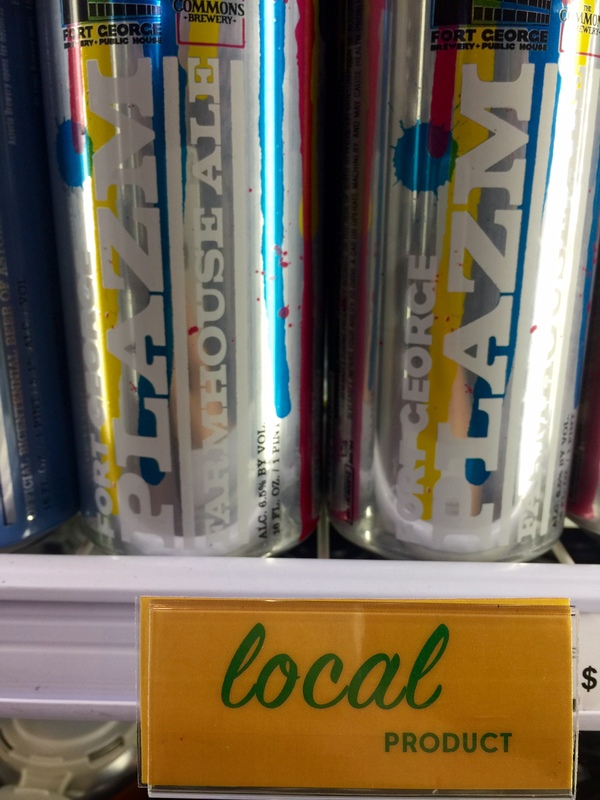 Why care about the Co-op’s definition of local? It’s the freshest and richest quality in terms of flavor and nutritional density. When food isn’t transported hundreds or thousands of miles this greatly cuts down on fossil fuel use and greenhouse gas. It’s pretty scary to think about food security, but it’s not just an issue that’s off in the distant future. The drought in California is causing agriculture shortages, resulting in food price increases; an example of why supporting the growth of farms in our area is important. We really like our farmers and other local producers, and want them to succeed with good jobs. We know how hard they work, sometimes for little to no return. As the Co-op grows, our consumer-owners, shoppers, and board have all said that more local food should be a key element. In our fall survey, shoppers said supporting local, sustainable agriculture is the number one social issue the Co-op should champion. Our strategic plan reflects this stating in the next five years we will expand our capacity to buy and sell local food and products. And throughout that journey we will be explaining what our local is.